Yet another month over in the blink of an eye! May's theme was chosen by the wonderful and very talented Lesley Watt and was Tide Pools or Rock Pools as we call them over here. When I think of rock pools I always think of sea anemones, I have never seen any in the wild, only ever in the sea life centre, but thats where my mind heads straight to. I tend to be easily distracted! 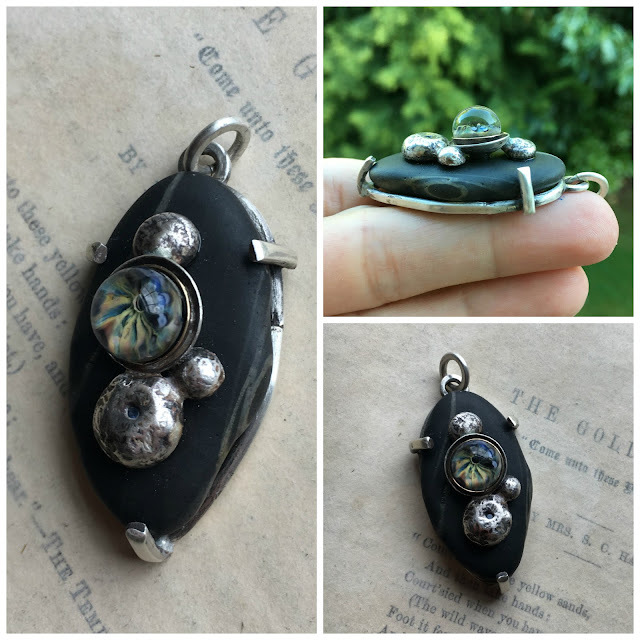 The main stone has a hole drilled through the centre and the headpin (which is set in a 9ct gold bezel) and "rocks" (which are all soldered together as one piece) have been set as you would set a stone on stone. The actual stone has then been set in a very thick sterling silver prong setting. 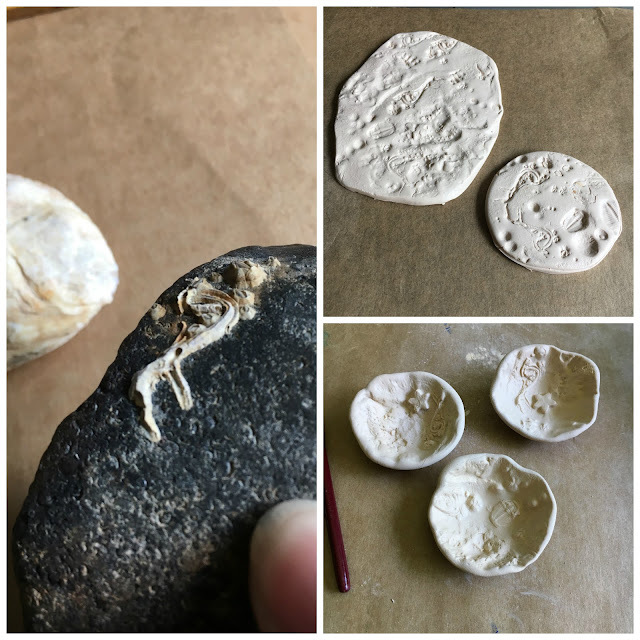 I started off by gathering some of my sea stones, shells and sea glass that had interesting patterns on it and then I added in a few tiny fossils (I'm thinking rock pool in the Jurassic Coast, in Devon a place that is on my bucket list to visit) I then made a fimo texture plate with these pieces and tested it on the fimo before breaking open the metal clay. I really love this piece and it turned out much better then I expected, again it is coloured with many layers of water colour paint that pooled into the recesses, a few coats of matt varnish and then a thick coat of resin. I love how much it looks like ceramic and am planing to make a little metal stand for it, possibly out of a domed coin with three soldered rocks for legs! I had so much fun this month, Thank you Leslie for inspiring us!